Gesa Stedman interviewed Friederike Zöllner, owner of the bookshop Buchlokal in Berlin-Pankow, for the Literary Field Kaleidoscope. The German version of the interview is available via this link (German pdf), an English pdf file here (link to English pdf). When and why did Buchlokal first open? Which core areas does the shop cater for? Buchlokal was first opened with a literary evening event on 15 December 2011. There were several reasons for opening the shop. I’m the founder and owner of the bookstore and before starting Buchlokal, I worked in a leading position in the marketing and sales department of a publishing house. I had long had plans to start my own business and after the birth of my second child, I worked at home for my employer for a while. It sounds contradictory to start a business with more and longer hours which one’s own business bring at a time when one has a growing family but I saw a greater chance to fulfil my own plans on the book market, in the selection of books that I wanted to sell and also regarding my own working hours. The choice of location in Berlin-Pankow depended first of all on my own knowledge of the area. I had grown up in neighbouring Prenzlauer Berg and have lived for more than 20 years in Alt-Pankow. When Buchlokal was first founded, there were far fewer bookshops in the area than today, and I saw a chance for my shop, an independent and characteristic venture, not least because I had grown up nearby and had been able to observe the market for a long time. We serve two main areas of interest: literary fiction and children’s and young adult books. Good non-fiction, crime novels, art and craft books and a small but special selection of graphic novels and cookery books complement our range of offerings. Apart from the contents of the books, we focus on the appearance and design of the books, and what they feel like. Originally, I have a craft background, I trained as a bookbinder, and the core of my family has a book-industry related job – printer, editor etc., so offering a large selection of special books, mostly in hardback, is natural for me. We check hundreds of catalogues twice a year, talk to sales reps and explore book fairs and sometimes even other bookshops, to find the right kinds of books for our customers – a selection which shows our delight in and commitment to good and aesthetically pleasing books. What can you say about the first years in Pankow? The first five years worked out even better than we expected, regarding our customers’ interest in our shop. But tragic personal events during the opening phase forced me to redirect some of my energy to other, more pressing matters, so that my ability to focus on the project entirely was heavily curtailed. No one can calculate the effects of dramatic events in advance. After these five years our shop is still in its start-up phase but this is energizing, too, since we – my partner joined me two years ago and works closely with me – still see a lot of room for development of our business. We see our hope justified that our idea and how we made it come alive has worked out. The majority of our customers come from the neighbourhood, people who like the proximity of the shop, but also what we offer, including ideas for last-minute presents. This provides us with more than just a basis, it is a solid foundation – not that we can sit back and do nothing, but we can calculate with reasonable entrepreneurial confidence. Our selection meets the interests of many customers but we also surprise them with books which they wouldn’t have discovered otherwise. Moreover, tourists spot us on their way to the chateau in the park – on their way from the city to Schloss Schönhausen they have to pass our shop. We also acquire new customers because we cooperate with many educational institutions such as schools and kindergartens in the area. How do you reach your clients? Our shop is situated in a well-frequented side street, it is a corner shop with three windows, a good place to open a shop and become visible. That in itself isn’t a guarantee for continued success, of course. Our hand-picked selection of books is the main magnet for our customers. We choose from about 700 publishers’ offerings the books which find space on our shelves. I think the shop shows how much love, knowledge and passion for books we have. We believe in more good books, good bookshops with good booksellers and customers who appreciate this. We also organize events of course, public and private ones. All public events are announced via an email mailing list so that everyone who subscribes to the list has a chance to hear first about our events which are often sold out. 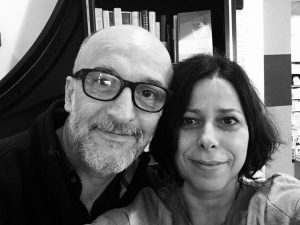 We organize classic readings, book launches for non-fiction but also craft-oriented themes with workshops (e.g. on urban sketching) and sometimes events about ‘older’ books which we think deserve to be better known because they disappeared among all the other competing forms of everyday distractions since too many books get published every six months. From the beginning, we have organized exhibitions of book illustrations, once a year for a longer period (March/April to October) which does more justice to the exhibiting artist and is easier for us since we also accompany the exhibition with one or two events. We have been given awards for our literacy projects several times, in 2016 was the most recent one, and we were awarded for being the best bookshop in Berlin with children’s books. How do you ensure that future generations of readers will read and buy books? We cater for future generations with our activities centred on schools and kindergartens. 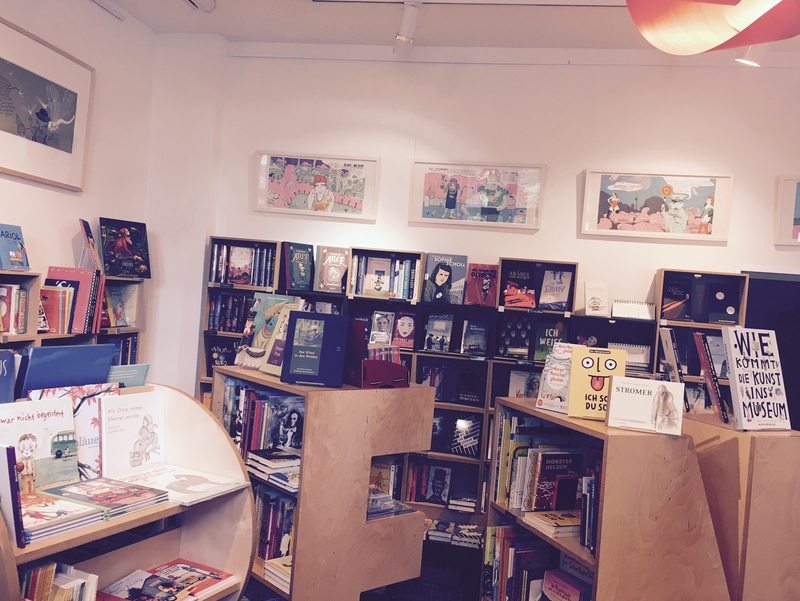 We give direct access to books – we don’t want to preach to anyone, in our shop books can be looked at and read, reading is fun, an experience everyone can have in our shop. 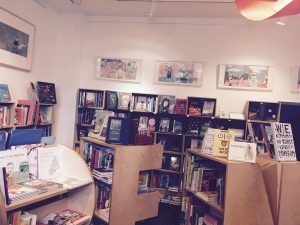 What role do independent bookshops play in the literary field in general? 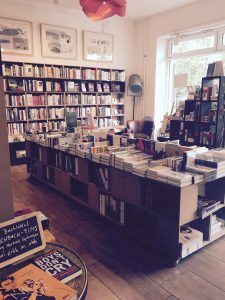 Independent bookshops are, unfortunately, quite dependent – they depend on the location and that determines how literary and up-market their offer can be. Independent bookshops with their broad range of individuality reflect the whole spectrum of the book market. How would you judge the competition from the internet? Well, we also have an online shop although our actual shop has the highest priority for us. We have an online shop with some special features with which the global big player can’t compete. Orders placed till 5pm can be collected in the shop on the next day, at no extra cost. Orders sent to a different delivery address can also be arranged. Neither we nor our fellow independent bookshops need to hide our light under a bushel! When the shop opened in 2011, the internet and internet book sales were no longer in their infancy. I knew what I was doing, the internet existed already so I wasn’t overwhelmed by it. I set up my business plan with the internet context in mind, and knew that it also offers chances. I don’t feel threatened.